Some parts of New Zealand are more likely to experience severe earthquakes than others. The colours on this map indicate the likely severity of shaking in different areas – in technical terms, the ground motion which has a 10% chance of occurring within 50 years. These predictions are based on the distribution of active faults, how frequently faults have moved in the past, and the location of historic earthquakes. 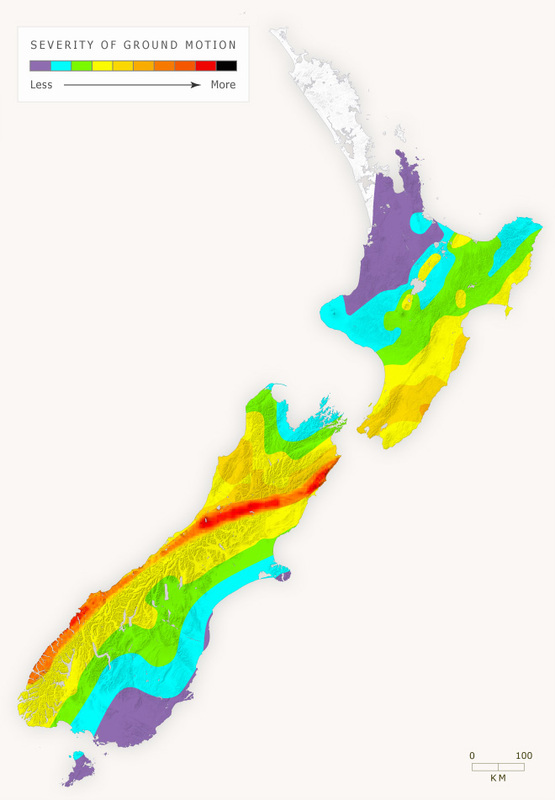 The zone where the strongest shaking is likely corresponds to the southern part of the Alpine Fault, extending along the Hope Fault into Marlborough. The 2010–11 Canterbury earthquakes are outside the areas of greatest statistical risk of high ground shaking. This illustrates the point that large earthquakes may occur anywhere in the New Zealand region, not just in the highest risk areas. It's the thought of moving south that brought me to this web site. Gives the north another edge. Begs the question, why would we support a govt that would welcome offshore drilling? Thanks for your comment Zoe. Thanks for your comment Zoe. While it might seem that the map is wrong, other factors also contributed to the severity of shaking in Christchurch recently. This blog post might explain it better: http://blog.teara.govt.nz/2011/02/24/wellington-christchurchs-earthquake-risk/.